Valve honcho Gabe Newell wants to bring Steamworks to the Xbox 360 but says Microsoft needs to relax a little and get comfortable first. Counter-Strike: Global Offensive is coming to consoles as well as the PC and Valve hopes to bring Steamworks integration to the console versions too, much as it did with the PlayStation 3 version of Portal 2. But while Sony is down with the idea, Newell said Microsoft needs to relax the restrictions on Xbox Live before it can happen. "We certainly can deliver a lot of value to customers to the degree to which we have those capabilities. 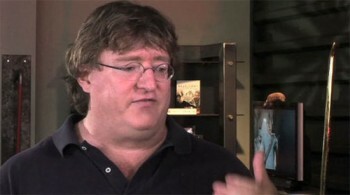 With the PS3 obviously we made a lot more progress with that," Newell told Eurogamer. "The PS3 customers of Portal 2 are going to start to see the benefits of that with Portal 2 DLC coming out in September. So we'd really like to be able to do that for Xbox customers as well." "The main thing is having Microsoft get comfortable with it and let us do it. Right now, there's a huge amount of updates and free content we've been able to deliver to people who have The Orange Box that we haven't been able to deliver to the Xbox because of the restrictions that have been placed on us on Xbox Live," he continued. "We'd love to see those relaxed." One of the things Newell hopes will convince Microsoft to unclench a bit is the success Sony is experiencing with its "more open approach." "Hopefully that will help Microsoft see that's a good strategy for making customers happy, that the barbarians won't tear down the walls of Xbox and turn it into some chaotic wasteland," he said. Counter-Strike: Global Offensive is being developed for the PC, Xbox 360, PlayStation 3 and Mac, and is expected to come out sometime in 2012.